My mum is visiting me at the moment. It's lovely and typically motherly, with lots of dinners at home, walks in the park and someone to chat to over a coffee in the morning. In my childhood we used to go to the Opera in the Domain (in Sydney) every January. I loved the freedom to explore the night with my friends while my parents lazed on picnic rugs and watched the opera. To me it was perfect, but apparently it has gone down hill a little bit in the last couple of years. Last night we were talking about what Mum had been doing over summer and she said something that shocked me. It went something along the lines of "Opera in the Domain was fabulous this year. Mazda is sponsoring it now and it was just fabulous." My mother, an stereotypical Empty Nester who goes on holidays and is smack bang in the target for new car buyers (and has recently bought one), noticed, remembered, and talked about a piece of sponsorship communications?? Not only that, but she attributes this year's improvements to the sponsor. 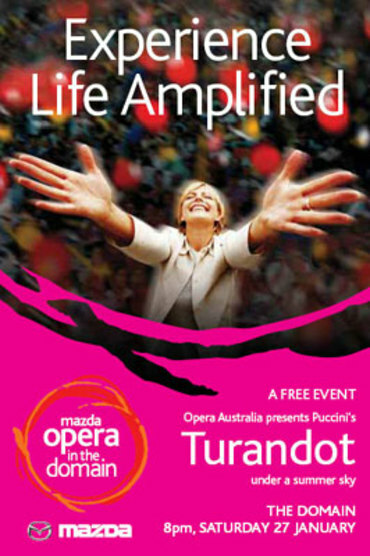 I wonder how Opera Australia feels about that.